Last Sunday after the Allegany Nature Pilgrimage we started banding over at the CLDC MAPS (Monitoring Avian Productivity and Survivorship) banding station. We placed bands on 14 species and we placed new bands on 19 individuals. In addition to the newly banded birds we recaptured 2 Song Sparrows, 4 Common Yellowthroats, 1 House Wren and 1 Indigo Bunting which were previous year banded birds (for a total of 27 individuals). The highlight was the Canada Warbler, Mourning Warbler and Wilson’s Warbler (first for the station and year bird for me CHECK). 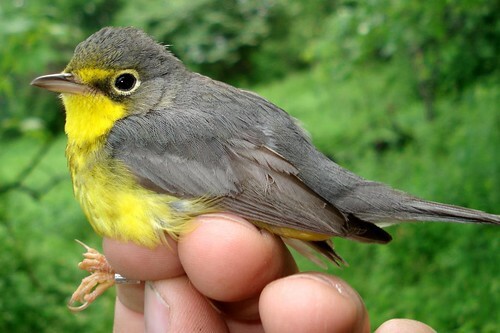 The Wilson’s Warbler was a late migrant passing through the area and is a target species of Sharon who does her spring migration studies at the James A. Zaepfel Nature Sanctuary. 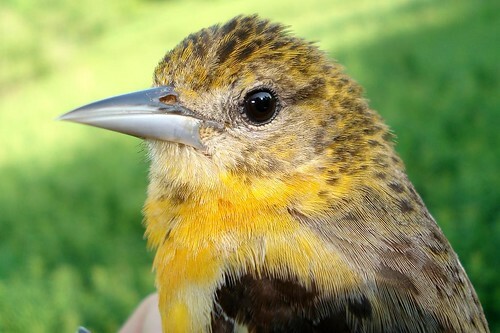 Other great birds captured included the Common Yellowthroat, Chestnut-sided Warbler, Baltimore Oriole, Indigo Bunting, Red-eyed Vireo and Blue Jay. Looking for a molt limit! 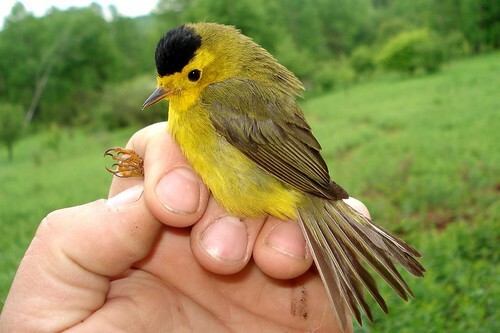 With the Wilson’s Warbler being the first bird of the year and that same net check having a Mourning Warbler then followed by a Canada Warbler next net check . . . . . you would have anticipated an amazing day. But our consistency with capturing birds after 9am quickly slowed down due to the site becoming a bit windy! I probably should have canceled the banding after then but the wind was only patchy at times. Over all I do think it affected our banding success for the site. Young Naturalist J and myself! This entry was posted on 3 June 2009 by mon@rch. 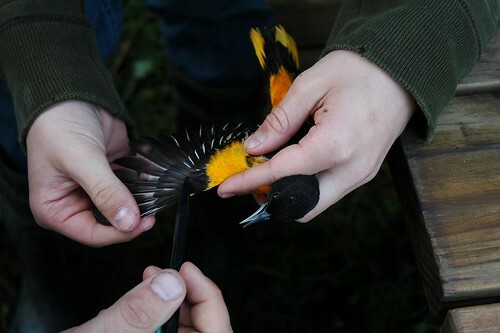 It was filed under Bird Banding, Birds, CLDC Station, Flickr, Kids, migration, Nature, Ornithology, photography . I have the first comment, yeah me! Naturalist J looks overly happy in the last picture. Love all the birds. Lots of pretty birds. J does look like he is enjoying this very much! Beautiful little bird. Love the detail in its feathers. What an amazing shot of the Baltimore Oriole. It seems to be looking off in te distance. Maybe it is hoping for freedom! I am dying to learn to band. The closest I get now is extricating birds from our deer mesh. Wow, those are some awesome birdies, Tom! It’s so cool to see J is still interested! You done good, Tom! I love those warbler shots.